DRIVING DIRECTIONS to Inside West Point Mill from I-85: take Exit 176, Duke Street. Head north on Duke St. away from Northgate Mall. In 2.3 miles, Duke St. will merge with Roxboro Street. Continue north on Roxboro St. for 1 mile. At the Seven Oaks Road stoplight, turn left into the entrance of West Point on the Eno City Park. Just past the entrance, the park drive veers to the right and becomes one way. Park in the first parking lot on the left. The physical address is 5101 North Roxboro Street, Durham NC 27704. HIKING DIRECTIONS to West Point Mill: Walk toward the north end of this first parking area. Take the sidewalk past the historic McCown-Mangum House. Once the sidewalk ends, continue in a straight line across the open field to the second gravel parking lot (you can also park here). Pass straight through the lot and cross the gravel park drive. You should see the mill come into view directly ahead. The walk is only a couple hundred yards. 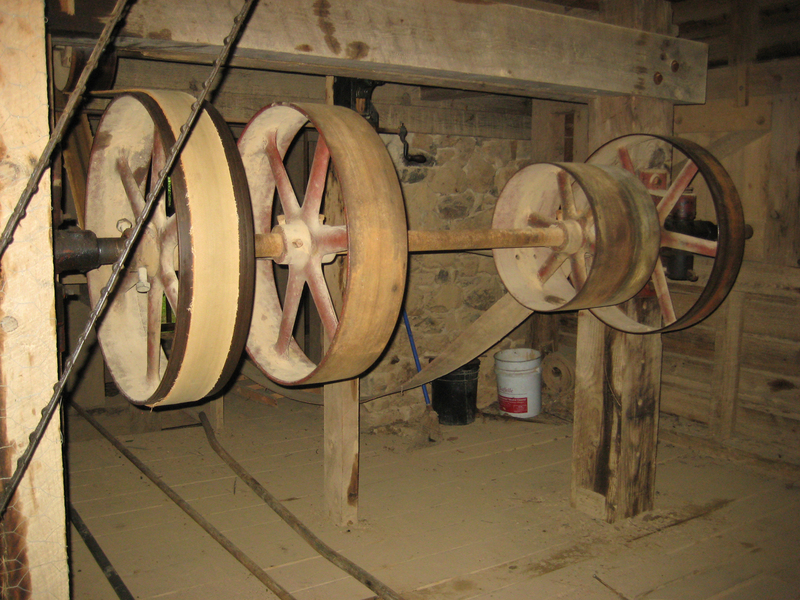 ATTENTION: The inside of the mill is open to the public on weekends from 1-5 p.m. April through December. Call West Point on the Eno City Park at 919-471-1623 if you have any questions. When is the last time you visited a working mill? We hope you can make out to this month’s hidden gem. It’s a fun place to visit with family, but make sure to do your homework before you go! Everything you need to know can be found here: www.enoriver.org/what-we-protect/parks/west-point-on-the-eno/. The page includes an article on the story of West Point as well as a narrated slide show (both links are in a box on the right side of the page). Also, make sure to click on the word ‘millers’ under the heading ‘History at West Point’ to learn about the significance of mills to the people of the Eno River Valley community. The photo below (bottom left) is of the machinery in the mill’s cog pit, specifically the main drive shaft with its gears and straps. When the building is open, then the miller is typically running the mill, allowing you to see the machinery in action and ask questions. Definitely exciting! The other photo (bottom right) is of raw goods brought to the mill and the millings produced through the process of grinding. 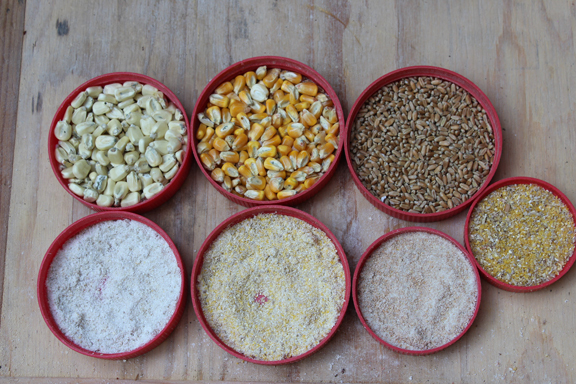 Currently, yellow and white corn are ground into corn meal and grits, while wheat is ground into flour. All three products are available for purchase.